Ever since its initial construction for the 1950 World Cup, the Estádio Jornalista Mário Filho in Rio de Janeiro – Maracanã, for short – has been one of the world’s most imposing and fascinating football arenas. In the beginning the venue was reported to have housed almost 200,000 spectators for a World Cup game, a record which still stands today. Even today the Maracanã remains one of the world’s largest sporting venues. In addition, high-profile rock and pop concerts have been staged here and Pope John Paul II celebrated a much noted mass there in 1980. During the more than six decades of its existence, the stadium has been renovated several times in order to equip it for the evolving requirements. At present this national monument is being converted into a highly modern multi-functional arena for the 2014 FIFA World Cup as well as the 2016 Summer Olympics and Paralympics. High-quality water fittings from GROHE have been specified for the new sanitary facilities. Daniel Fernandes from the São Paulo-based firm Fernandes Arquitetos Associados is the man responsible for the modernisation concept. This massive reconstruction project includes a refurbishment of the restrooms inside the Estádio Municipal do Maracanã. The planners specified reliable WC flushing cisterns from GROHE in combination with high-quality Skate Cosmopolitan wall plates in stainless steel. While the dual flush design gives users the choice between a three-litre and a six-litre flush, the start-stop function allows for further water savings in line with actual requirements. GROHE EcoJoy® technology helps cut water consumption without compromising on comfort and functionality. The modern plate design blends discreetly and elegantly into the new washroom decor. 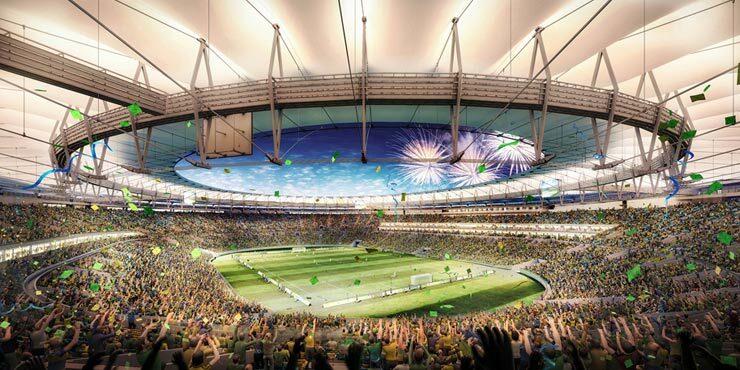 Soon the eyes of the world will be once again on the Maracanã – a legendary stadium which continues to embody architectural, technical and sporting excellence in a unique way.